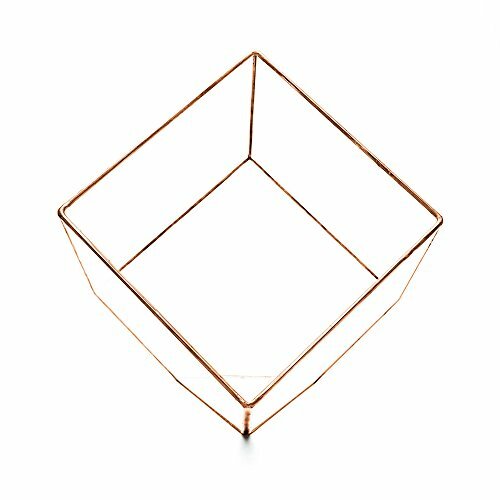 The Supersize Copper Cube Terrarium is perfect for the out of the box buyer who wants the instant effect without getting too involved. Stunning and exclusive gift for every occasion that is guaranteed to bring any space to life. High quality glassware. The Urban Botanist creates design led terrariums making the perfect addition to any home, hotel, restaurant, bar, office or commercial premises. The terrarium can sit on any flat surface. Frame only - Aztec Copper Cube Terrarium. Also available fully assembled with faux succulent plants and LED lights. Assembly secured using our unique patent pending technology. Perfect gift for any occasion or special event including birthdays, Father's Day, Mother's Day, Wedding Day, Corporate Event. Indoor artificial plant for interior design schemes for home, hotel and leisure, office and business environments. A must have Interior Designer accessory. Volume discounts available on request. If you have any questions about this product by The Urban Botanist, contact us by completing and submitting the form below. If you are looking for a specif part number, please include it with your message.